Not only are sleeves on a winter bridal dress super practical, they’re also gorgeous and totally on trend. Whether you opt for opaque sleeves to keep you warm or exquisite lace or appliqued sleeves is a matter of personal choice but really, sleeves of some length are a must-have. 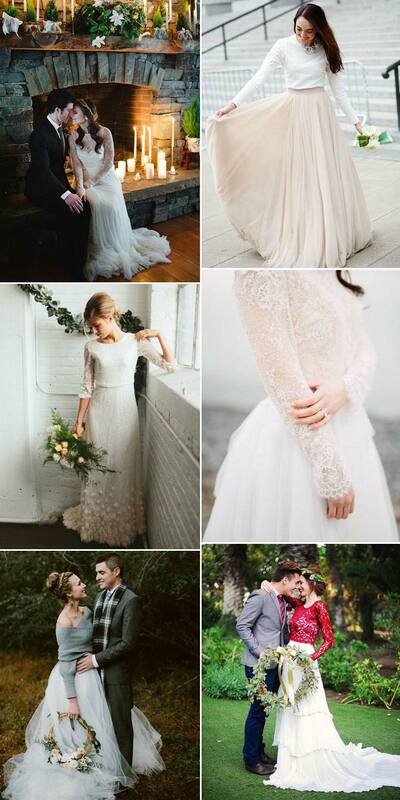 A contrast in textures can really make a winter wedding dress something very special indeed. Look at designs that have an obvious difference between bodice and skirt for a really gorgeous look. Don’t be afraid to go for colour for your winter wedding. A coloured gown is, of course, a fantastic choice and I really love cool greys and blues in winter. If you’d prefer just a splash of colour, how about a coloured bodice or even colourful embroidery. Oh yes, a winter dress definitely needs embellishments and a hint of sparkle can be a really good thing. I love embellished capes or shrugs or even glamorous sparkles around cuffs and hems. A daring touch. If you’re planning a more glamorous winter affair, then don’t be afraid to bring a daring touch or two to your wedding dress. A thigh split or a revealing back will be sure to attract plenty of admiring glances from guests. Cosy accessories. I really can’t get enough of cosy accessories at winter weddings. Think of big shawls, scarves, wraps and chunky knits when you’re deciding on your bridal ensemble. You can create a really individual look with your accessories and don’t forget, if the temperature plunges, you might be grateful of the extra layer if you’re hoping for romantic couple portraits outside! Now that we’re all dreaming of winter beauty, I’m just going to leave you with a couple of practical tips. Firstly, if you want a winter wedding dress, speak to your bridal boutique before you visit. Make sure that they’ve got styles available for you to try on that meet your criteria and you’re not just going to see rails full of summery styles. Think carefully about your shoes too – strappy styles might not be the best idea if you’re going to be outside in the winter and if you’re ordering any bridal accessories online in the run-up to Christmas, make sure that you leave plenty of extra time for delivery.